The Vendée is a départment in the Pays de Loire region of western France, lying to the south of Brittany and with a long Atlantic coastline. It has an area of 7,015 km2, about the size of Devon, and a population of 627,000 (compared with 1,110,000 for Devon). The primary drivers of the Vendéen economy are tourism, agriculture, food processing and light/medium industry. Wine is produced and marketed under the ‘Fiefs Vendeens’ designation. A microclimate, similar to that of the Côte d'Azur, brings 2,500 hours of sunshine to the Vendée's 140 km of superb sandy beaches and its beautiful rural countryside. There are many towns and villages to explore and and there is an abundance of churches, abbeys, chateaux and historic sites. The marshlands of the Marais Poitevin are famous for wildlife and the Mervent-Vouvant forest is popular with walkers. The internationally renowned yacht race, the Vendée Globe, has its home in the fishing port of Les Sables d’Olonne, and the historical theme park at Puy de Fou attracts many visitors. The main towns are La Roche-sur-Yon, Challans, Les Herbiers, Les Sables-d'Olonne and Fontenay-le-Comte. Whilst it has no international airport of its own, the Vendée is reasonably served by international airports at Nantes (in Loire-Atlantique), La Rochelle (in Charente-Maritime) and Poitiers (in Vienne), and is within 2-3 hours drive of the ferry services from St Malo, Caen and Cherbourg. It is served by fast train (TGV) from Paris and the A87 autoroute. 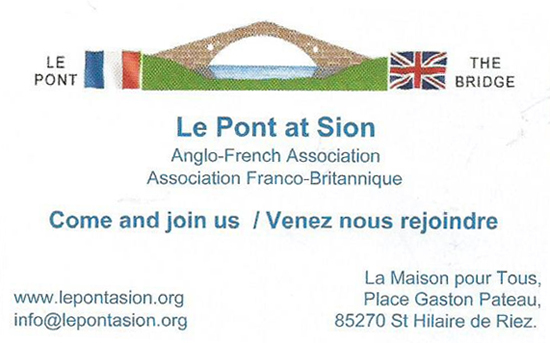 Le Pont at Sion is a secular association but which includes ASV Members and is open and welcoming to all.